Commonly used for: Cash Back, Fair Credit, No Annual Fee, No Foreign Transaction Fees, Student. 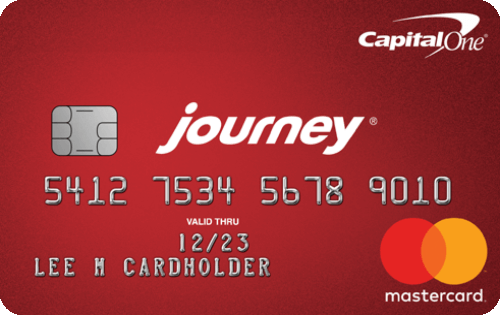 Journey Student Rewards from Capital One is a decent credit card for those just starting to build credit. It offers a flat rewards rate that we tend to value above rotating categories, but you’ll probably earn less with this card than with other student credit cards that offer rewards. For example, the Discover it® Student chrome offers 2% cash back at restaurants and gas stations (up to $1,000 in combined purchases each quarter). Oh, and that annual percentage rate is frightening if you don’t pay your balance in full each month. In the right hands, Journey Student Rewards isn’t a bad choice. In the pro column, there’s no downside to earning 1% cash back on spending. You’ll also get rewarded for good payment behavior. Make an on-time payment and get an extra boost for a total reward of 1.25% cash back for the month. Keep making those on-time payments for the first five months, and you could qualify for a higher credit line. Pair this A+ behavior with a balance well below your card’s max-out level and you could end up raising your overall credit score — a worthy goal for anyone just starting out. And since Journey Student Rewards doesn’t charge foreign transaction fees, it could be a great card for students who travel or study abroad. Keep in mind that just because the card has “student” in the title doesn’t automatically mean it’s a fit for anyone who’s matriculating. If you do your homework, you’ll see that both the Discover® it Student chrome and the Discover it® Student Cash Back offer better rewards. You may also qualify for a lower APR with those cards. Journey Student Rewards charges a high 26.96% variable APR. That’s the con column. Anyone who wants a low-maintenance credit card that awards cash back and rewards good payment behavior should consider Journey Student Rewards. You only need average credit to apply for this card. This card offers rewards, which many cards aimed at those with average credit do not. You can increase your credit limit with good payment behavior. The APR on purchases and balance transfers is higher than the industry average. There are other cards with better reward rates. There’s no introductory bonus with this card. Your monthly income must exceed your monthly rent or mortgage payment by at least $425. This card has a variable APR of 26.96%. You’ll pay no annual fee. Since this card is issued through Capital One Bank, cardholders can access and track their credit scores for free using the CreditWise online tool. You can redeem rewards through the Capital One website as a statement credit or request a check to be mailed. There is no cap on the amount of rewards you can earn and they never expire as long as the account is open and in good standing.